To keep track of your balance on your phone please download QR & Barcode Scanner app. To love and to be loved is what every heart desires. Let your sweetheart know how much you love and care for him / her by sending our love cards! 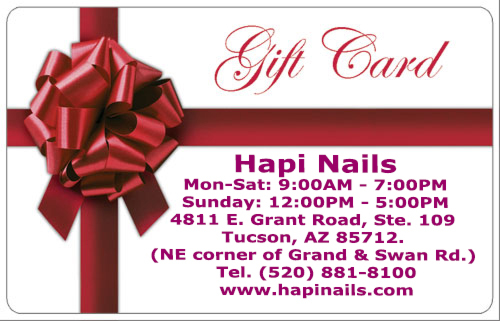 Buy our gift card for your loved one. Enter desired certificate value. You can set any value between 10.00 and 250.00 USD per person. 3. 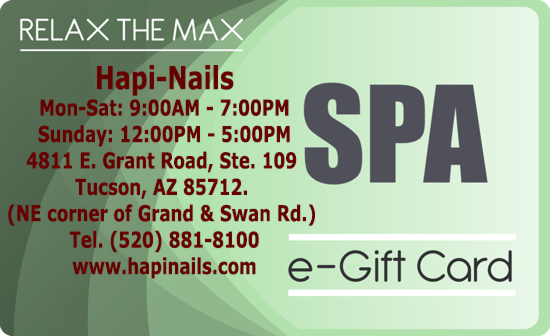 To view your Gift Card balance, please call (520) 881-8100. 4. 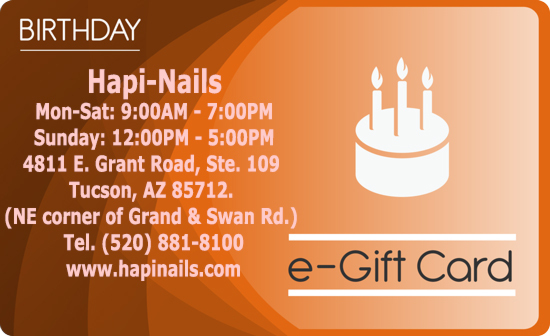 You may not return or cancel your Hapi-Nails e-gift card after it is received. 10. 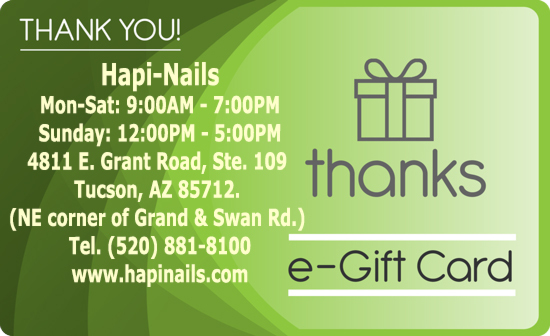 If you need assistance with any aspect of your purchase, ownership, or use of your e-gift card, please call (520) 881-8100. Please refer to your order number, or be ready to supply your email address. 11. 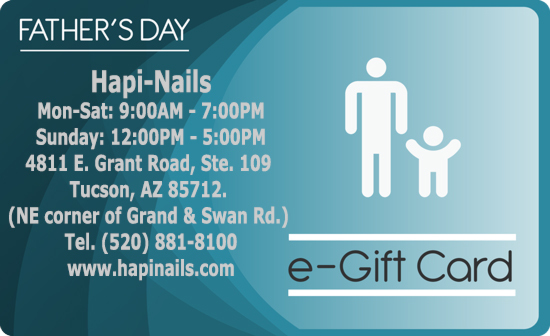 Hapi-Nails e-gift cards may be paid for with a valid VISA, MasterCard, Discover, American Express or PayPal. 12. All orders of e-gift cards are subject to a process that compares purchaser information provided on the web site with information about the purchaser provided by the purchaser's financial institution. 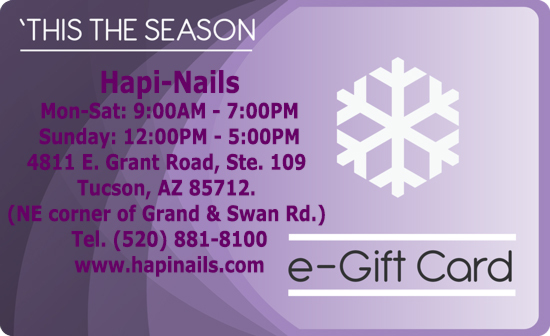 If there is a discrepancy, your e-gift card order may be delayed until it can be corrected. 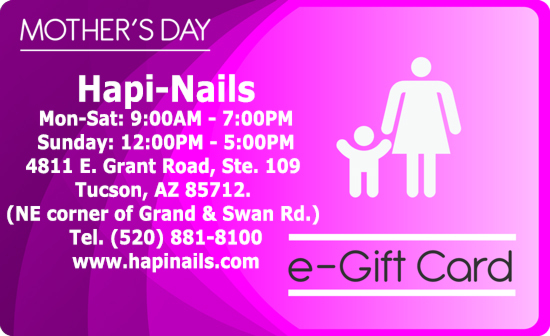 If you have concerns about your order, please call (520) 881-8100. Please refer to your order number, or be ready to supply your email address. 15. 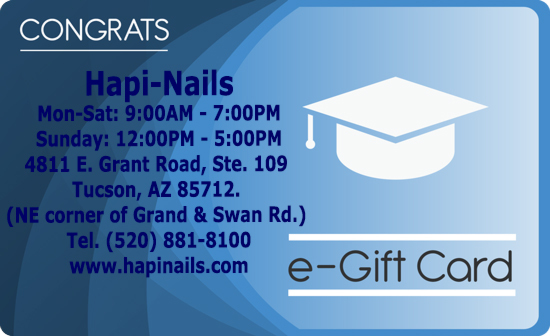 If a spam filter is blocking Hapi-Nails Gift Cards emails from getting to an inbox, the email options will need to be modified so that Hapi-Nails Gift Cards emails are not considered spam. If you need further assistance, please call (520) 881-8100. Please refer to your order number, or be ready to supply your email address. 16. If you wish to add a personal message to an e-gift card, simply type your message in the Message field during the purchase process. 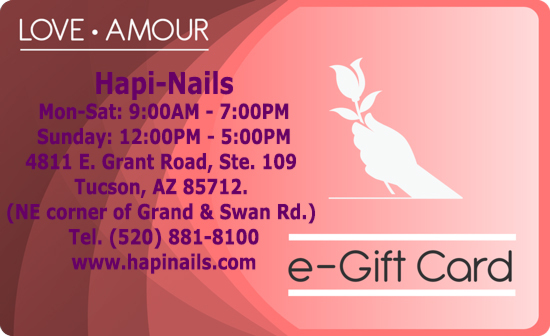 Personal messages are limited in length to the space provided on the e-gift card. There is no additional charge to include a personalized message. If we find inappropriate, offensive or otherwise objectionable messages, we reserve the right to cancel them. Thanks for your cooperation.